I love reading books. I buy books from time to time if I feel their contents would be interesting, without considering where they’re published. And finally I got pissed off, twice. 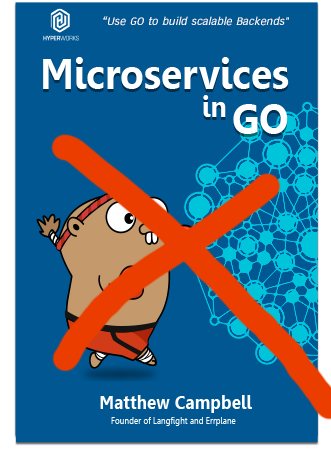 Someday in last year while browsing a programming community, I read an announcement that someone was writing a new book covering how to build microservices in Go language. Since I was focusing designing our company’s backend architect, I thought it’d offer good experience from someone who had dig into this work. $15 is a fair price if it’s well written, and the author promised to finish it in 2015. Sold! It’s never been updated since then, only left some messy organizations of the book structure and lack-value chapters. I had no idea what had happend until one day on September I found this book on O’Reilly website. Weird, huh? So I wrote a letter to the author for progress, got a reply that the book had been transferred to O’Reilly, would be finished in half a year and everyone who bought it before can get a fully copy when released. Time flies and another 8 months passed. There was no news, not to mention that the website turned into a online lottery site for for quite a while. I lost my patience and wrote again, this time Mr.Campbell kindly offered to issue a refund because he couldn’t finished the book in a near future(O’Reilly’s editor was not happy with what he had written down and guided him to rewrite it from scratch). Okay, that wasn’t a result I want, but a practical solution, so I accepted. But what? Another 2 months till now I still not get my money back, and Mr.Campbell doesn’t repond any longer. Maybe he is too busy to say something, but his Twitter status is not that quiet. I can’t wait forever, have nothing can do but give up. Go, The Standard Library I bought is another lesson to me. Leanpub allows authors to sell their books from the beginning, and never ask them to finish. go-thestdlib has some in depth chapters that marked as WIP for more than a year, when asked about it the author Mr.Huckstep replied that he has lots of person stuffs & even has issues with Leanpub that he can’t work on it. What a shame when you receive money from others but can’t keep your promise, and Leanpub the store doesn’t have a countermeasure on this situation. Conversely, my experience with formal publishers is usually a joy. For example, Manning sells MEAP books, too, but they offer full refund guarantees if any customer is unsatisfied, e.g. Go in Action; not to mention that O’Reilly’s continuous revisions to perfect a book, e.g. Learning Python. So why take risks to throw money in water when we have much better options from renowned publishers? TL;DR Spend money on good books from renowned publishers, instead of unknown indie authors, whom lacks motivations to perfect their works once receives money.